Stupid Leonardo Bonucci defends Cagliari fans after racial abuse. The defender outrageously blames Moise Kean for being racially abused. Leonardo Bonucci had a brain freeze, blaming his team-mate Moise Kean for being racially abused by the Cagliari fans. In the second half of Juventus’ away game against Cagliari, the fans in the Curva made loud and audible monkey chants whenever Moise Kean touched the ball. The chants did not die down though, with the game finishing with a minority group of supporters continuing to attack Juventus racially as it was the only way they could make themselves be heard, with Juventus clearing Cagliari up on the pitch. 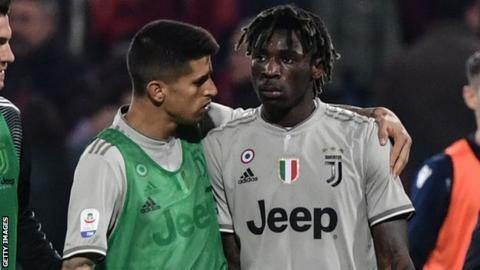 But the biggest shock of the night came at the end of the game, when Leonardo bonucci, former captain of AC Milan, came out and blamed Moise Kean for the racial abuse pelted at him and Blaise Matuidi! “Kean knows that when he scores a goal, he has to focus on celebrating with his team-mates. He knows he could’ve done something differently too. There were racist jeers after the goal, Blaise heard it and was angered. “If Bernardeschi had celebrated like that, he would’ve been treated exactly the same way by our fans. If Dybala had the same drama queen antics after the goal that Matuidi did, he would’ve been treated exactly the same way. As always in life, there are idiots who do stupid things and ruin it for everyone else. I don’t think talking about it all the time helps. I don’t think halting play helps, because not everyone in the stadium did that. As always, the Italian game is marred by yet another racial controversy, but what should be even more alarming is when your own team-mate blame you for your African descent and use it as an excuse to defend the racist idiots who bring shame to the beautiful game of football. Have your say on the Bonucci idiocy by sharing your thoughts with us. Write to contact@indifoot.com or find us on Instagram, Twitter and Facebook.